I’m Amazing was released a few hours ago, and Rolling Stone has reported it is a tribute to recently-deceased boxing champ Muhammad Ali. You can listen to it via the YouTube embed below. It’s a long track at 7:28; a length which has allowed for a diverse range of sounds to be incorporated comfortably. I have a bad habit of comparing music I hear to that of other artists, but, when it comes to giving recommendations, that is very useful. 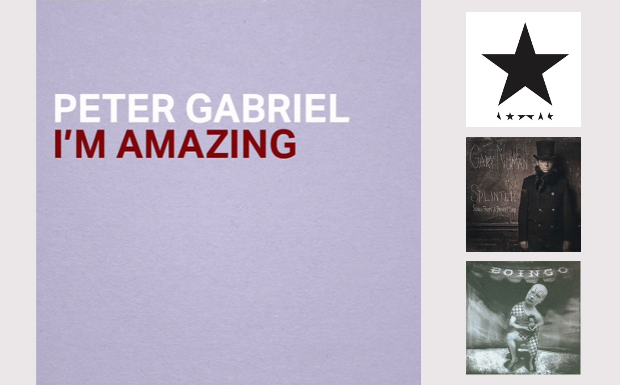 While the new Gabriel song is unique, it does stand as a great launching place for musical exploration. I’m Amazing is held together with an industrial-style drumbeat which permeates most of the song. The intro vocals remind me of quite a few artists; I’m convinced Thom Yorke (Radiohead) has had similar vocals in the past but I can’t pinpoint the song, however I can identify similar recent releases from of two of Gabriel’s contemporaries: David Bowie, and Gary Numan. The most striking similarities can be found in the title song of David Bowie’s stellar final album, Blackstar. If you have somehow missed out on hearing one of Bowie’s best songs – or want to hear it again (and let’s face it, who doesn’t?) – click play below. I’m Amazing‘s industrial roots align it firmly with Gary Numan. “Isn’t he that electropop artist who did Cars? How is this like him?” you may ask… if you didn’t catch Numan’s magnificent 2013 release Splinter (Songs from a Broken Mind). The song below demonstrates some of those musical similarities, but you can also hear vocal similarities throughout Splinter. You can stream the whole album at Consequence of Sound. One of the most interesting parts of the song is a long African-style ending. I’m sad to say my knowledge of African music is not very broad, so I cannot recommend anything similar to that sound. If you know anything similar to that or any part of the song, please leave a suggestion in the comments.